» The Compleat SAM S. TAYLOR. The Compleat SAM S. TAYLOR. It was well over a year ago that Victor Berch, Bill Pronzini and I put together our annotated bibliography of Dutton’s line of Guilt Edged hardcover mysteries, and luckily we haven’t had to make very many corrections. The Guilt Edged line lasted from 1947 to 1956, with the two most highly collectible authors in the group arguably being Mickey Spillane and Fredric Brown. There were lots of unknowns as well, but William Campbell Gault was a Guilt Edged author, and so were Lionel White, Stewart Sterling and Sam S. Taylor. If you know all of those names, congratulate yourself. If you know all but the last one, give yourself only half a pat on the back. It was in Sam S. Taylor’s entry in which we recently discovered that we were in error. According to all of the sources we consulted at the time, Taylor was supposed have died in 1958, soon after his last book. Not so, and I’ll get to the correct date in a minute. First, though, is Taylor’s complete entry in Crime Fiction IV, by Allen J. Hubin, as it stood until a few weeks ago, slightly edited and expanded. TAYLOR, SAM(UEL) S. (1895-1958); see pseudonym Lehi Zane; Radio and film scriptwriter, short story writer. Series Character: Neal Cotten, in all titles. * Sleep No More. 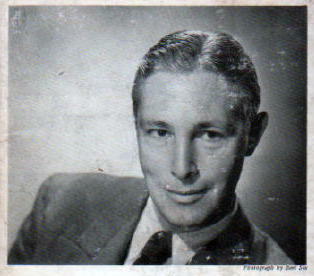 Dutton, hc, 1949. Signet 821, pb, 1950. Boardman, UK, 1951. * No Head for Her Pillow. Dutton, hc, 1952. Signet 1057, pb, 1953. Foulsham, UK, 1954. * So Cold, My Bed. Dutton, hc,1953. Signet 1247, pb, 1955. Foulsham, UK, 1955. * Brenda. Gold Medal 264, pbo, 1952. Red Seal, UK, 1957. It turns out that both dates for Mr. Taylor were wrong. After reading our first efforts, one of his sons emailed me, stating that his father died in 1994, not 1958. This was enough to go on. Victor then did a search in Social Security records and came up with a Samuel S. Taylor who was born October 11, 1903 and died February 1994 in California. Having a ready-made excuse for compiling a compleat profile, we did, and here is the result. Jackets of the hardcovers in the Bill Pronzini collection provided the blurbs and other information. The paperback covers came from various other sources. I still can’t get to my own accumulation of books. 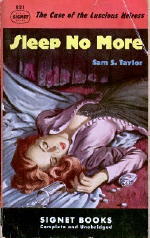 Sam S. Taylor, author of No Head for Her Pillow, is the author of one other mystery story, Sleep No More, published by E. P. Dutton & Company in 1949. Innumerable radio scripts, and a good many magazine stories round out a full writing career. Upon receiving a medical discharge from the U. S. Coast Guard in 1943, Mr. Taylor affiliated himself with the Army Signal Corps as expert consultant on training films, where he also wrote many scripts for Army posts. His personal interest in crime (from the observer’s seat) stems from that time when, as a member of the New York City special panel of jurors, he was called to serve on the famous Jimmy Hines case, prosecuted by Gov. Thomas E. Dewey. When Mr. Taylor first married his beautiful French Canadian bride, she spoke no English; Mr. Taylor now has a French accent after three years of marriage. Mr. Taylor makes his home in Tarzana, California, with his wife and baby. Or so thought Neal Cotten, head of the brand-new Cotten Bureau of Investigation. That was before a simple case of blackmail developed into a hunt for a desperate killer … a grim hunt that led from a luxurious mansion in Pacific Crest to a shoddy flop-house on Skid Row; from a remote ranch in Nevada to a crooked gambling house in Angel Gardens. But none of it made sense. Not until Neal took Jennie, the Polish waitress, to see Madame Butterfly … and Jennie innocently gave him the lead that cracked the case wide open. A swift-paced tale of homicide and passion, of violence and corruption, set against the vivid background of Los Angeles, Sleep No More will be devoured by mystery fans in one breathless sitting. NO HEAD FOR HER PILLOW. It may be an everyday occurrence among artists and art dealers to mutter vindictively, “Oh, I could kill him!” as it is among the brotherhood of almost any other business. No Head for Her Pillow has a couple of artists, an art dealer, some racketeers, some newspaper people, and Neal Cotten, director of the Cotten Bureau of Investigation and his own chief operative. It was a good thing for California art circles that Neal was hired by Colonel Millard Baldwin, publisher of the San Vincente Sun, to aid in the Sun‘s campaign against the slot-machine racket in the city. Investigations, of whatever kind, often lead to murder, as well as vice versa, and slot machines sometimes turn up more than merely lemons. The proof of these adages is offered, with dividends, in No Head for Her Pillow, a fast exciting mystery that is almost as tough as a forty-cent steak. Private eye Neal Cotten has a visit from a beautiful doll who commissions him to trace her aunt, an oldtime actress. Her story sounds phony but she pays cash so he takes the job. His first link to her whereabouts is a thug who offers to sell him information, but the deal is never closed. The thug is murdered. Neal stays with it and finds the old actress who spends most of her time in a specially made coffin. Then Neal gets a new client — the governor’s wife, no less, who thinks her stepdaughter is running in bad company. There is a link between the murdered thug and his pals, the beautiful client, the lady in the coffin and the governor’s family, but it is one murder and many near misses later that Neal gets the pitch and solves the case, with a night club singer in distress slowing up the process considerably. Sam Taylor is already known for his original and fast-paced mysteries through his earlier books Sleep No More and No Head For Her Pillow. His new one, So Cold, My Bed spells top entertainment for the mystery fan as it again features Neal Cotten, the hard-boiled but likeable private eye who has a way with the ladies and an affinity for easy money and screwy cases. There was the simple, pious valley town. And there was luscious, lustful Brenda. The hard-handed farmers knew work — and prayer. Brenda knew pleasure — and conquest. Tragedy rode on the wings of passion when good and evil clashed. “Summer is a Bad Time” — Manhunt, October 1953. “A Clear Picture” — Manhunt, May 1954. “State Line” — Manhunt, September 1954. “The General Slept Here” — Manhunt, April 1955 (with Neal Cotten). “Dig It, Brother” — The Saint, May 1956. I didn’t mention it because I hadn’t even given a thought as who the wrong Sam Taylor might have been. But you’re quite right. Checking out IMDB, one of the several Sam Taylors you’ll find there did live from 1895 to 1958. He seems to have mostly been a writer in the 1920s silent film era, but he turns up as a director as late as 1957, that being a US-Italian film starring Marlene Dietrich called Montecarlo, aka The Monte Carlo Story. It does indeed. Thanks for getting in touch, and for adding a few more details. I’ve eliminated the reference to a daughter, and otherwise tided things up. Sam Taylor, the Author, was born in New York City. I have been there once and I think its across the street from Central Park in or around an area now known as Harlem. I have an address here somewhere and will post it when I find it. On the cover of No Head for her Pillow, the disposed women lying on the floor would be Sam S. Taylor wife, Denise and would also be my mother. Thought you might be interested. I am reading “the General Slept here” in Manhunt now. Is it a shorter version of the book “so cold, so dead” featuring Neal Cotten? Thanks. Right now you may be the best person to answer that. Compare the story you’re reading with the synopsis of SO COLD, SO DEAD as given above. I see no mention of a general, but other than that, what’s your opinion? Lots and lots of similarities but I guess different. He is commissioned to find a doll’s aunt and a thug is similarly killed off. Rather than a coffin, the aunt sleeps in special bed (once slept in by General Robert E. Lee). No mention of the governor’s wife but I suspect the tie-ups to conclude the story will be similar. I am interested in these three Cotten books bc if similar to this story they should have a lot of “Chandlerisms”. Do you have any recommendations for similar writers? I read all of Howard Browne and that was exactly what I was looking for. Thanks! Thanks for adding the details. I’d say you’re right about the novel being an expansion of the short story, even if revised considerably along the way. Sam Taylor did die in 1994. He was in the hospital during the California Earthquake and died a few days later. I was there when he died. Oldest son of three sons. Any information you can supply as to why your father stopped writing criminous novels and short stories in the ‘50s?